It’s the most trafficked animal in the entire would, and you probably have never heard of it. It has scales, yet is a mammal. It has a tongue that is twice as long as its body, and looks like a modern day artichoke dinosaur that lives in the trees and on the ground. Even more, they are trafficked for their scales, which are boiled off of their bodies for use in traditional Eastern medicine; for their meat, often a delicacy in the same areas; and for their blood, which some claim can heal. A travesty to be sure. Words cannot begin to describe why on earth anyone would trade and traffic in such an elusive and amazingly unique animal. 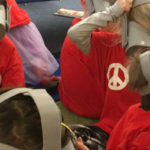 New interactive games in Education Centre. Save Vietnam’s Wildlife collaborates with Wildlife Protection Solutions to develop the wildlife education games on the torch screen to increase the interaction between the visitors with the messages we want to send cross. Our Education Centre was the main place to educate 1,200 kids in the last two months and thousands’ visitors. We hope to continue to change to make our centre becoming a best destination for people to learn about wildlife conservation. According to IUCN, all eight species of pangolins are being eaten to extinction and no known records of their remaining numbers actually exist anywhere. There is virtually no information available on population levels of any species of Asian pangolin and no comprehensive population estimates. This species is rarely observed, principally because of its increasing rarity, but also because it is secretive, elusive and primarily nocturnal. Which is why we’ve sent our team out to Vietnam to work with Save Vietnam’s Wildlife. SVW works as a national non-profit organisation, committed to protecting and increasing populations of threatened wildlife in Vietnam by rescuing threatened animals, protecting entire populations and ensuring secured habitats. They act to identify and select the best solutions which encompass high conservation value, are scientifically based, consider human requirements and empower people to take informed action. We recently traveled there to install a gaming system in their new nature center, which is focused on teaching the benefits of local wildlife to the community. It’s focus was not just the pangolins, but also other rare and endangered animals, such as the fishing cat, which is a medium-sized wild cat of South and Southeast Asia. Since 2016, it has been listed as Vulnerable on the IUCN Red List. 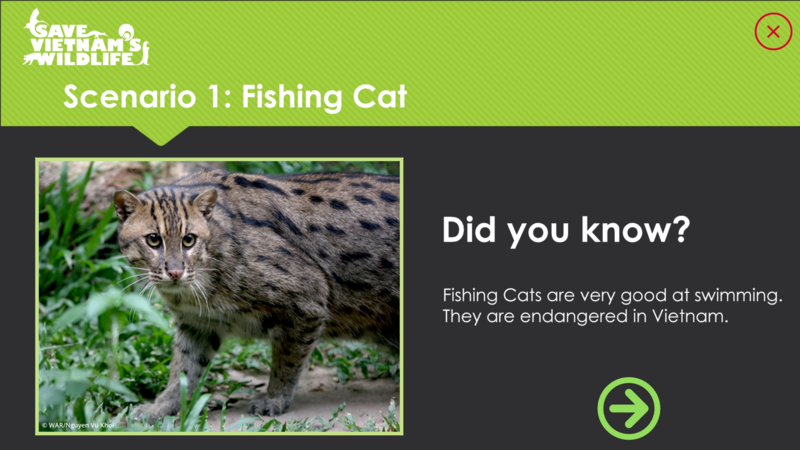 Fishing cat populations are threatened by destruction of wetlands and declined severely over the last decade. The cats live foremost in the vicinity of wetlands, along rivers, streams, oxbow lakes, in swamps and mangroves. It’s amazing to see the game in action and it really pushes your knowledge gaps. I myself had a tough time deciphering whether or not I should buy a pangolin at a market as a protective measure to ensure it was saved. Turns out it’s better to quickly report the merchant, as the pangolin is part of a commercial trade ban. I failed terribly the first time I took the quiz actually, because my empathetic heart just wanted to take all the animals away from these brutal conditions. Luckily, there are experts out there who really know the “ins-and-outs” of the wildlife trade and are best suited to saving these last surviving species.